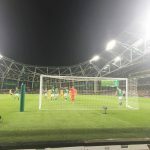 Martin O’Neill’s oft-repeated excuse of Ireland not having the players to compete in the passing stakes with superior opposition was laid bare last Thursday. Once again, our team spent the evening chasing shadows while set up in a barely discernable formation. The difference is that this time our opponents didn’t have a Gareth Bale or a Christian Eriksen in their ranks and in fact had a squad unquestionably weaker than that our manager can choose from. The problem is not with the players, it’s with the management. From the off, it was clear that this was going to be a disappointing evening. 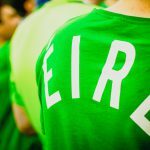 A two-year news diet of Brexit and the proximity to the annual poppy fascism gauntlet that James McClean has to shamefully endure in England has seen a hardening of attitudes in the seven years since Northern Ireland last came to Dublin, let alone the three since the last game against England. Our choice to have an extra pint and skip the anthems was vindicated by the boos we could trace from both ends during the playing of Amhrán na bhFiann and God Save The Queen as we came through the turnstiles. Add the 25th anniversary of the famous Windsor Park clash where Alan McLoughlin’s goal saved Ireland’s World Cup 94 qualifying campaign into the mix and the wisdom of arranging a friendly with our nearest neighbours has to be questioned. I’ve watched us play the North at Lansdowne in 1989, 1993, 1995, 1999 and 2011. On none of those occasions have I witnessed the nasty edge and provo chants that were present last Thursday. We mainly rose above it. While the abuse clearly wasn’t at the level that we were subjected to in that qualifier a quarter of a century ago, the fact that most of it came from lads that were probably still in nappies when that game was played and remember nothing of the troubles was depressing. Yet, what’s been transpiring in the Ireland camp on and off the field is more depressing still. Every time the team has gone into camp in the last 12 months, there’s been a feeling that we must have reached rock bottom. But every time, the management find new depths to plumb. There followed a bizarre and snidey exchange with Pundit Arena journalist Richard Barrett which I’ve copied here for context. Richard Barrett: Having spoken to a source close to Michael Obafemi directly his intentions were clear that he wants to commit to Ireland. Has anything changed over the last number of days? Martin O’ Neill: Sorry who have you spoken to? RB: Someone very close to him. MON: Is that right? You’re further on than me. MON: Who did you speak to? 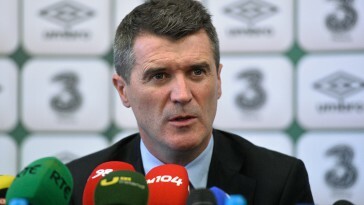 RB: I can’t reveal that, but they said his intentions are very clear that he wants to play with Ireland. MON: You can’t come in here and be half honest. RB: Would it be a surprise to see him line out on Thursday? 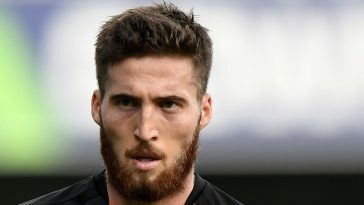 MON: Thursday is alright, Thursday is okay and I’m hoping that he can be in and we can use six subs in a friendly game so hopefully he’d be in the squad anyway for that game so no that wouldn’t be a surprise, the next game is the one. If he has total commitment he didn’t say that to me nor to be fair to me I didn’t press him on it because I haven’t had the opportunity to speak to his family but no, you’re ahead of the game you tell me. 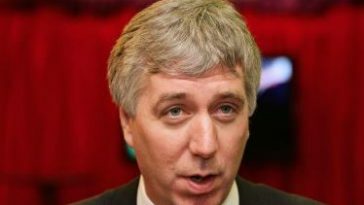 RB: Confident that he will declare for Ireland? MON: Am I confident? I’m always hopeful and I’ve always said that. I’m hopeful about Declan Rice too, hopeful you know? I can only be confident of something that I know I’m in control of or if that’s the case at least I know. I’m not in control of other people’s decisions, particularly issues like this which are very very important. I agree with you he has really enjoyed the training, he has enjoyed being brought in it seems. As Glenn (Whelan) has mentioned he did very very well and has got a lot of encouragement, a lot of encouragement from the backroom staff but also importantly he’s got a lot of encouragement from senior players like Glenn and Seamus Coleman so that sort of feeling has got to be good and if that’s the case fine. He might well have made his mind up even before coming over here, I’m curious as I said to you, you’re closer to him, I should bring you into the team. On a serious note though, in regards the game on Monday, if he does declare do I go and do that then and if he suddenly goes and changes his mind then? I’m not sure on that but overall yes I’m hopeful, and I think you’re confident. MON: You should come and see me afterwards, join us for lunch. If that was the case, and it certainly backs up what Barrett’s sources had said, then why was the manager undermining that and leaving the player exposed to the online abuse? O’Neill’s disdain for social media is on the record but it’s his job to manage situations like this. Rather than stage-managing what should have been a badly needed good news story, Thursday’s developments made him look foolish in the extreme when a player who he said was a “distance off” making a decision made that decision within 24 hours. And in fact, denied that said decision was ever in doubt. A tweet from Obafemi shortly afterwards seemed to seal the deal. Meanwhile, on pitch developments have been making O’Neill look foolish for a long time now. We lined up in what ostensibly seemed to be a 5-3-2 with Darragh Lenihan, Shane Duffy and John Egan taking the central defensive positions and Callum O’Dowda once again in an unfamiliar number 10 role. Robbie Brady made a long-awaited comeback after a year’s absence and Glenn Whelan was back for a farewell bow. The first ten minutes were passable with McClean’s tap into an empty net after O’Dowda had been flagged offside the closest thing to real excitement. Needless to say, McClean’s every touch was being booed by the North’s fans which generated significant response from the Irish support with various profanities filling the night air. But it wasn’t long before any semblance of a shape started to desert us and we really should have been one down after 13 minutes. Our defence was nowhere to be seen as Gavin Whyte was played in with only Darren Randolph to beat. The Boro keeper spread himself really well to deflect the ball clear but really Whyte should have been given no chance. Our only attacking outlet these days seems to be throwing Duffy up for a set-piece and hoping he gets a header on goal and that tactic nearly paid off ten minutes later with a great Brady delivery that was asking to be finished but this time Duffy mistimed his header, sending it into the ground and up high enough for Bailey Peacock-Farrell in the North’s goal to tip over the bar. 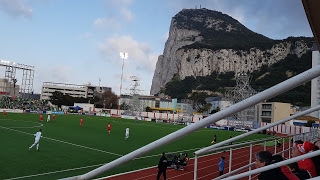 A similar chance on 34 minutes that Duffy headed straight at the keeper was as much as Ireland created and the highlight of the half was the applause that Whelan got as he was subbed five minutes before the break. He’s a player that had shipped a lot of unfair criticism during his career but the fact is that when he played, Ireland were generally a better team than when he didn’t. Indeed, despite a couple of lax passes, he was still one of Ireland’s better players on Thursday. 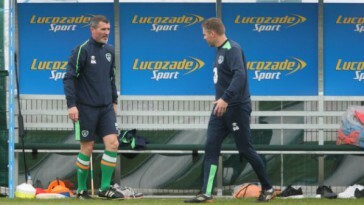 Throughout his career, he did the job he was asked to, whether it was by Giovanni Trapattoni or Martin O’Neill. The fact that both managers operate in a safety-first zone meant that Whelan took some unfair flak. But he is a good pro who will be missed and will always have that stunning Croke Park strike against Italy to look back on as one of the great Ireland goals. The half petered out with the North taking control forcing Randolph to save again from Whyte and then from Stuart Dallas to ensure the half finished goalless. Half-time saw the introduction of a young forward off the bench but after all the hoo-hah of the week, it wasn’t Michael Obafemi making his debut but Portsmouth’s Ronan Curtis, who has made a great impression at League One level after moving from Derry City in the summer. O’Dowda had been invisible in the 10 role and was the man to make way. A Seamus Coleman run and shout for a non-existent penalty was as good as it got for Ireland before the usual plethora of substitutions kicked in around the hour mark. 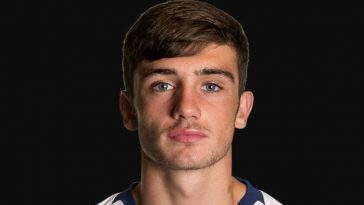 McClean was withdrawn which dialled down the vitriol from the Northern Ireland fans and Callum Robinson also came ashore with Enda Stevens and Seanie Maguire coming on. It made little difference to the direction the game was now flowing in. First, Michael Smith nearly took advantage of a goalmouth scramble only for Randolph to deny him. Then yet more calamitous defensive play, this time from Lenihan which gave Jordan Jones a very similar one-on-one as Whyte had in the first half. Much to everyone’s relief, the outcome was the same when in real terms it had no right to be. Any resemblance to a recognisable shape had departed Ireland by now and with gaps appearing all over the pitch, we were succeeding in making Michael O’Neill’s men look like tiki-taka experts with their best move just falling at the last hurdle before Steven Davies could get a shot off. Seanie Maguire’s rotten luck with injuries continued as his night was cut short 13 minutes after it started with Scott Hogan coming on as Obafemi was ignored again although the injury opened up a seat on the plane to Denmark for him. Cyrus Christie followed Hogan off the bench to take up some sort of midfield position and he managed to force a corner which came to nothing as the game fizzled out for a scoreless draw. Unsurprisingly, Randolph was announced as man of the match. Without him, there’s no doubt this would have ended up another defeat. The difference in the approach of the two Ireland’s and the two O’Neill’s was summed up in the post-match interviews. Northern Ireland’s Gavin Whyte spoke about his team’s organisation and how the manager has every role drilled into them, even if they’re coming off the bench. Meanwhile, Ronan Curtis revealed that no one had spoken about what was required of him until he was told to get ready at half-time. These are two ordinary sides with average players. Both lost a World Cup play-off and will finish bottom of their Nations League group. Yet one looked organised and simply lacked a cutting edge throughout their campaign and again on Thursday. The other looks rudderless, shapeless and not only lacks a cutting edge up front but is also very shaky at the back. One camp seems happy and content while the other is beset with leaks, misunderstandings at best and arguments at worst. One manager is getting paid roughly €600k while the other is getting three times that with his assistant taking home a higher salary than the Northern Ireland boss. And for what? Bar a late victory against a second-string USA side during the summer, Ireland are now winless in 10 games. The two goals scored that night remain the only goals scored at home since Shane Duffy put us ahead before our Danish capitulation a year ago. In our last 17 games, we’ve won 3, drawn 6 and lost 8. In terms of tactics and on field organisation and execution of a gameplan, the football is far worse than I watch inferior players produce week in, week out at Bohs. There’s no indication that this will change despite O’Neill’s bullish insistence that he will qualify us for Euro 2020 because, in his own words, he’s “good”. At this stage, he’s just about the only one left that thinks so.